Once again the very nice program developed by JOE, K1JT, the MAP65-IQ connected together with LINRAD and the RFspace receiver SDR-IQ, with the Hamtronics 2m Converter, you can see a large portion of the 2m band for EME qso's. Also a nice program developed by Rene, PE1L with the name Livecq 144 you can upload in the web all the stations having CQ or QRZ before the call and no other info. 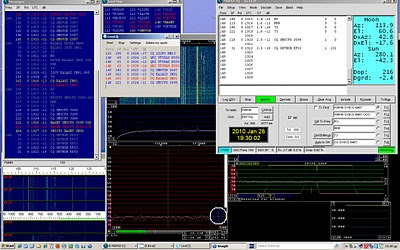 With the live cq www.livecq144.com you can check the activity in EME, the propagation, the trafic etc. Every station calling CQ received by SDR-IQ & MAP65-IQ & Linrad it's uploaded on liveCQ web page.